Home > British Traditions > What's in the Traditional British Christmas? A traditional British Christmas means different things to different people, but there is certainly a ‘normal’ chain of events that many British people will connect with over the festive season. Two important social developments have made a big difference to this view of the traditional British Christmas. The first is the increasing secularisation of Britain and the second is the increase in the numbers of families living in different parts of the country. In previous generations, it would have been practically unheard of for families not to attend their local church on Christmas Day whereas now it is not really the norm. Similarly, many people would have lived near to their parents, grandparents and in-laws, so visiting family would not have to involve travelling the length and breadth of the UK’s motorways whilst trying to keep the children happy in the back of the car. The key elements to a traditional British Christmas usually involve food, presents, television and (surprisingly in a country where church attendance is decreasing) attending a church service. The quantities of each vary depending on your family! Let’s look at each in turn to discover what it means to have a traditional British Christmas. While many families have their own traditions for Christmas Eve supper, or Christmas Day breakfast, there are very few variations to the actual Christmas dinner on Christmas Day itself. Most families will sit down to a traditional Christmas dinner which is often referred to as ‘turkey with all the trimmings’. The term ‘trimmings’ can sound rather strange, but it means all the delicious accompaniments to the ‘main event’, which is a large roast turkey. Turkey is the most popular Christmas meat, although goose used to be more popular. Some families may also choose to roast a large chicken or have a piece of beef or pork. The trimmings usually include roast potatoes, sprouts, carrots, roast parsnips, gravy, sausages wrapped in bacon - commonly referred to as 'pigs in blankets' and different types of stuffing including: sage and onion; sausagemeat; chestnut and occasionally an apricot based stuffing. It can also include bread sauce, cranberry sauce, leeks, Swede, peas, Yorkshire pudding and mashed potatoes. Most families will have their favourite way to serve Christmas dinner, with the ubiquitous sprout often a cause for concern – it’s a well known ‘love it or hate it’ ingredient with many tales of childhood Christmas tantrums caused by having some of the little green fellows on the plate. In a traditional British Christmas, there are often a few different ‘source’ of presents and, much as people love to whinge about the increased rampant commercialism of Christmas, they would hate to not receive at least one carefully-chosen gift over the festive season. Some families like to open presents before eating their Christmas dinner, while others prefer to open them afterwards. 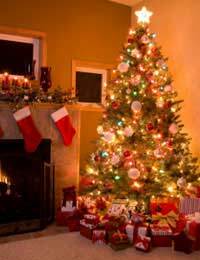 Many families have Christmas stockings, either for all family members or just for the younger ones. These can be a large knitted sock (bought or handmade) or a pillowcase. They are often put at the end of the child’s bed on Christmas Eve, or pinned to the mantlepiece. Father Christmas visits in the night to deliver presents to ‘good’ children. As well as the presents that have ‘come from Father Christmas’, most families give each other Christmas presents. There are some ‘classic’ Christmas presents that are considered a bit of a cliché – like soap-on-a-rope or handkerchiefs – so don’t buy these if you want to look original! Whilst Britain is made up of many different races and religions - the country remains a Christian one, with the monarch as the head of the church of England, ostensibly appointing the government of the day. Many people who were baptised Christians make an effort to attend church on Christmas day even if they don't for the rest of the year. Most Christian churches hold a daytime service as well as the famous midnight mass - and attendance at one of these services is often a family ritual in Britain. Although very few families sit watching television for the whole of Christmas Day, there are often parts of the schedule that appeal. A popular element of a traditional British Christmas is to watch the Queen’s Speech. A 3pm on Christmas Day, the BBC broadcasts a pre-recorded Christmas message from the Queen and many families think it is important to respect the occasion. So much so that they may time their Christmas dinner around watching it, with people often saying they eat before or after the Queen’s Speech. Other television traditions include the ‘big film’. There is always at least one family friendly film on in the early evening. In the evening there is often a James Bond film and some Christmas specials. Soap operas also have a longer episode around Christmas, or on the Day itself, where some major drama unfolds in the hope of winning the ratings war!